You could be forgiven for thinking my garlic plants were dead a couple of weeks ago, with their pale and dry withered stalks. But they’d simply had an attack of rust, which from previous experience I know can be harmless to the bulbs below ground. Sure enough, lifting them revealed a good healthy crop: a row each of (top to bottom) Bohemian Rose, Red Duke and Mikulov. The Bohemian Rose are big and juicy, the Red Duke smaller but nice and uniform and the Mikulov looks fine too but have that thing where the outer paper layer is missing so the cloves appear already separated. It makes the drying out process a little trickier as there’s soil in the nooks and crannies but that’s just natural veg growing for you. 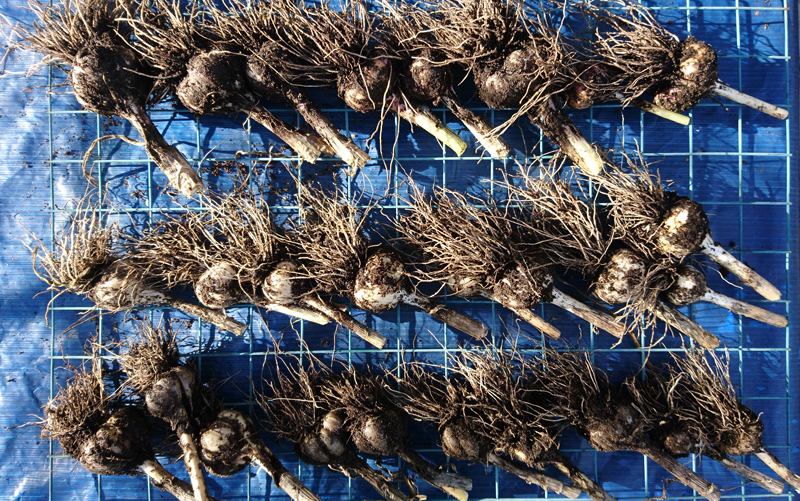 After a couple of weeks drying out I’ll brush the bulbs off, trim off the roots and put them in a special garlic storage bag which keeps them dry, cool and dark. I tried a couple of cloves of Bohemian Rose and it has a really good taste which, importantly, holds up well in cooking. 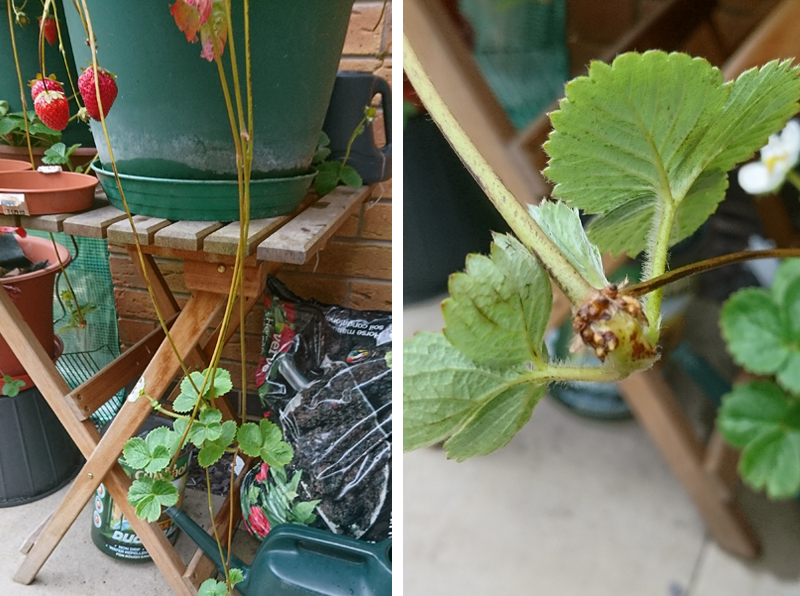 The strawberry plants have given their best harvest so far this year and are still bearing new flowers and fruit. They’re in their third year, which is supposed to be their peak and after which they’ll be less productive. Left: runners coming off strawberry plants. Right: close up the small roots are visible. So I’ve selected three good runners from the many they’ve thrown out lately and pinned them down into small pots. 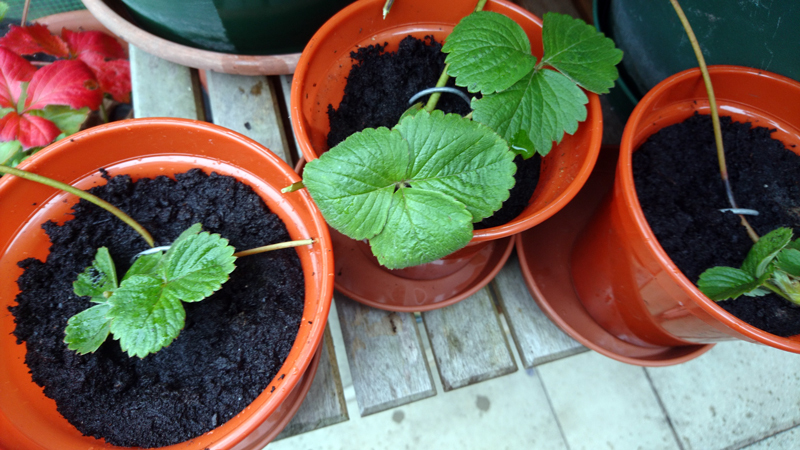 Once they’ve rooted into the new compost – probably a good few weeks away – I’ll snip off the runners to separate them from their mother plants and they will take over the mantle as the main strawberry plants for next year. Coming back from holiday a while back there were some great bean harvests waiting. A double row of Castandel dwarf French produced a big pile of crisp pencil-like beans (well, apart from never having seen a curved pencil). 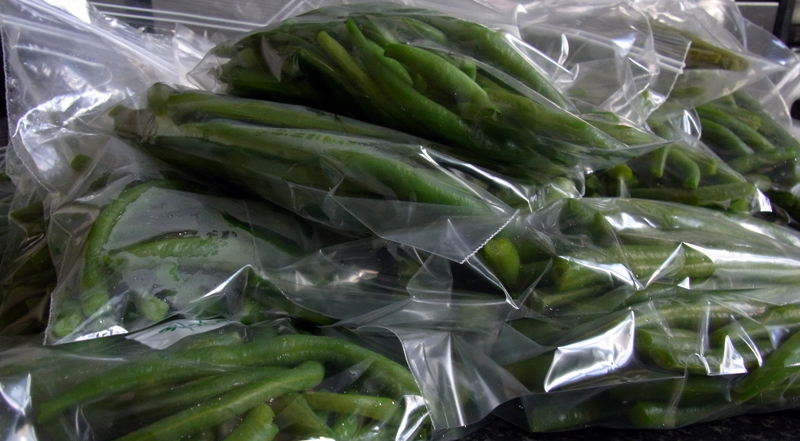 They were destined for the freezer so the production line was sort by size (small, medium, large), trim the ends, blanch in boiling water for a minute, then cold water to stop the cooking, then dry and put sensible portions into freezer bags. It takes a while but is great to see them all ready for use in the freezer afterwards. In an adjacent bed there are lots of handsome borlotti beans coming in from a dozen or so plants. 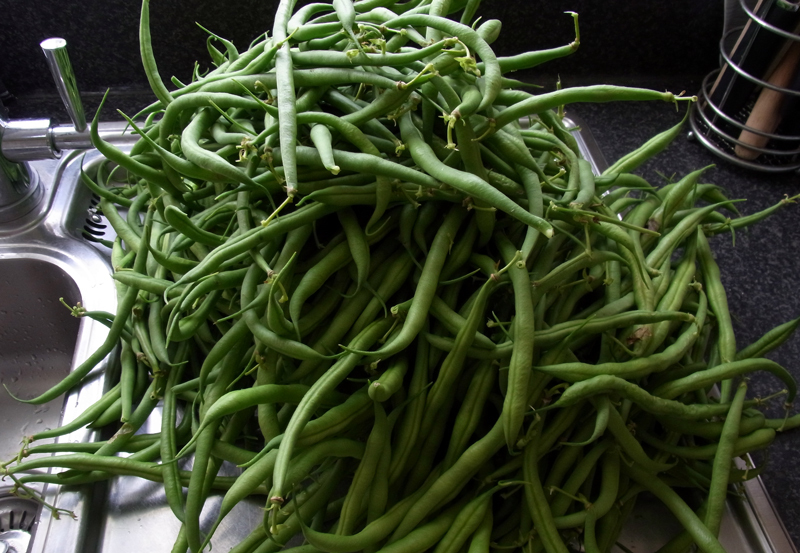 I’m eating these fresh as they come through, while the beans inside are still pale green rather than the speckled finish they develop later. They take a surprising amount of time to cook, needing a good long simmer in boiling water, but are very tasty. 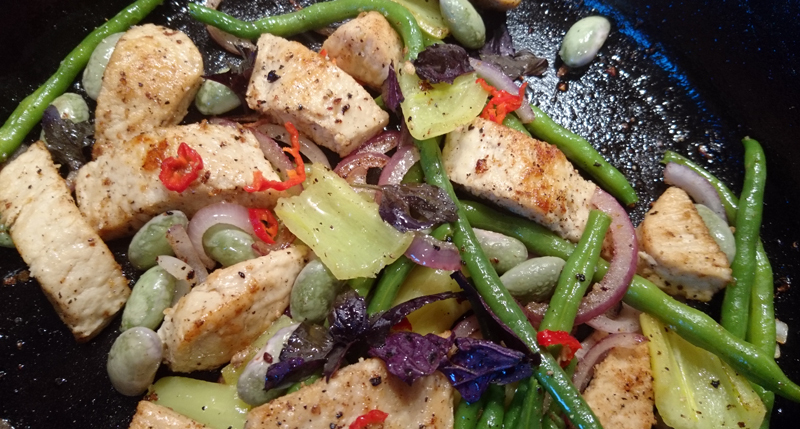 Picking a few beans, peppers and herbs as the basis of dinner most evenings is such a pleasure. 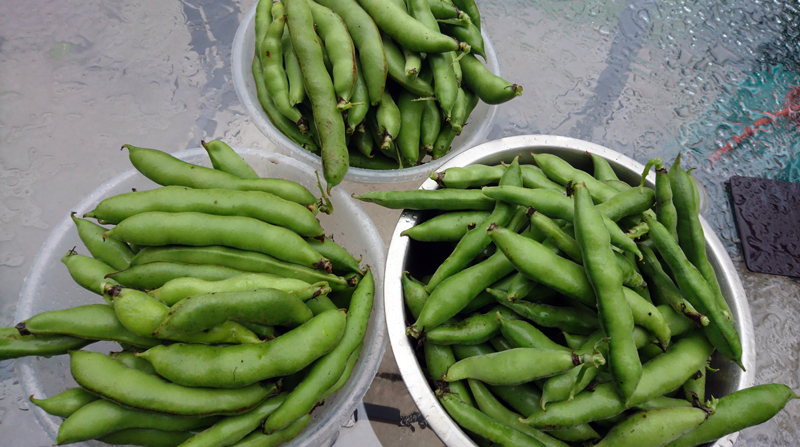 The broad beans had done very well too. I forgot to weigh them – it’s interesting sometimes to weigh and price up what things would have cost from the shop – but there were lots and lots. 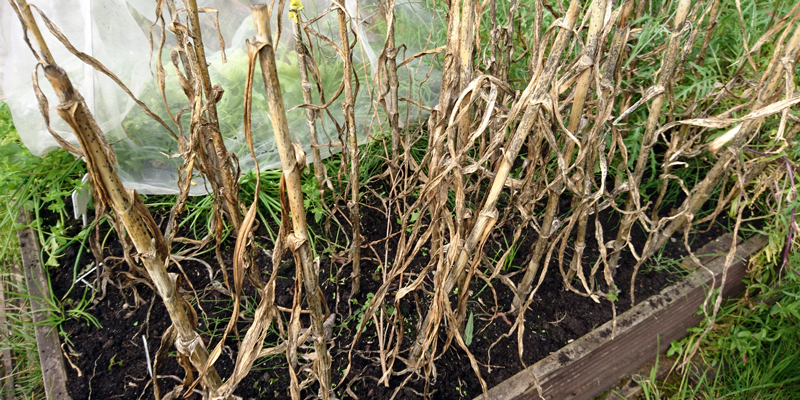 Unfortunately, pulling up the spent broad bean plants revealed the damage which pests had wrought upon other crops. 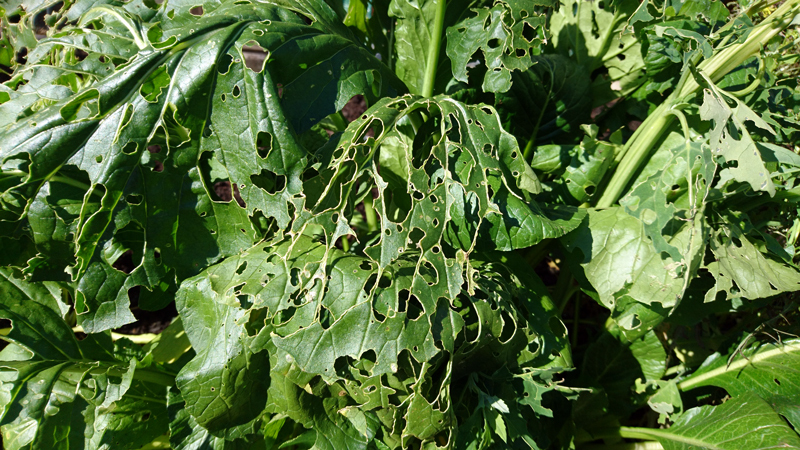 I was already aware it had happened: kale, Japanese leaves and spinach were all very visibly full of holes, but being able to take off the mesh tunnel revealed that everything had been riddled. I decided to cut the several dozens of plants right down to the ground but leave them in, so that they can re-grow after I’ve hopefully eradicated the pest. The guilty party was caterpillars – with the soil uncovered I could see dozens of then wriggling around no doubt wondering why the waiter had taken their dinner away before they’d finished. Mercilessly (you can get quite vengeful when you lose a load of crops) I applied pyrethum powder and a crawly death spray. A fortnight on, everything’s sprouting small new shoots and leaves and there are few signs of any nibbling going on. I’m sure the ground being open helps, by letting birds and ladybirds feed on anything they see crawling. It’s ironic really – you put a mesh tunnel over things to keep butterflies (caterpillars) off, but they still get through and the tunnel ends up protecting the caterpillars themselves from predators. This needs a rethink for next year. 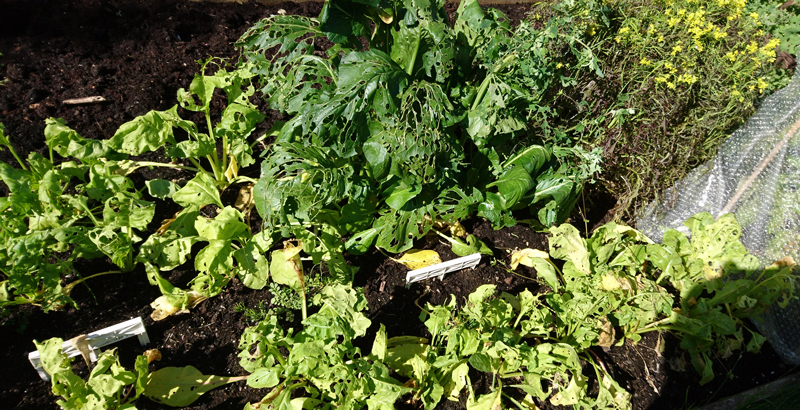 In the next bed along I had to pull out a load of lettuces as they were full of crawly things too. At least I’d been picking at those for a good while so had my money’s worth. There were a few close shaves though – when you’re about to put the top slice of bread onto a sandwich and spot something moving in the lettuce leaf! I actually think there may be something wrong with some of the beds. I have eight in total: four small, two medium and two huge (single, double and king size you might say). This year the crops in some of them have been poor, the worst culprit being medium bed two, where the potato crop – usually good – was no more than a 5lb bag from the supermarket. Next to the spuds was a row of four high quality (in theory) F1 tomato plants grown from seed. After a month or so in the bed they were thin and weak-looking, their leaves going pale and limp. I’m sure it’s a nutrient deficiency, the beds just having their nutrients washed out of them in the winter and early spring. I did add compost to every bed earlier in the year but clearly that wasn’t enough. I’ll shortly get a proper soil testing kit – one of those which tests separately for nitrogen, phosphorous and potassium – and see what that reveals. 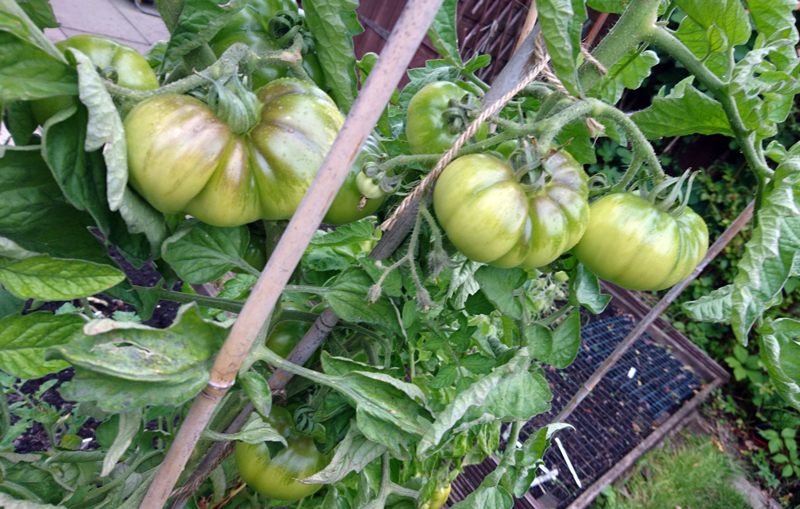 Meanwhile the weedy tomato plants are now moved to another bed where they’re doing better; nowhere near normal but they’ll knock out a few tomatoes each. There’s a world of difference with the tomato plants in the other beds: Marmande, Roma and Gardener’s Delight are all doing very well. The Marmande in particular have the thickest strongest stems I’ve seen on a tomato plant. 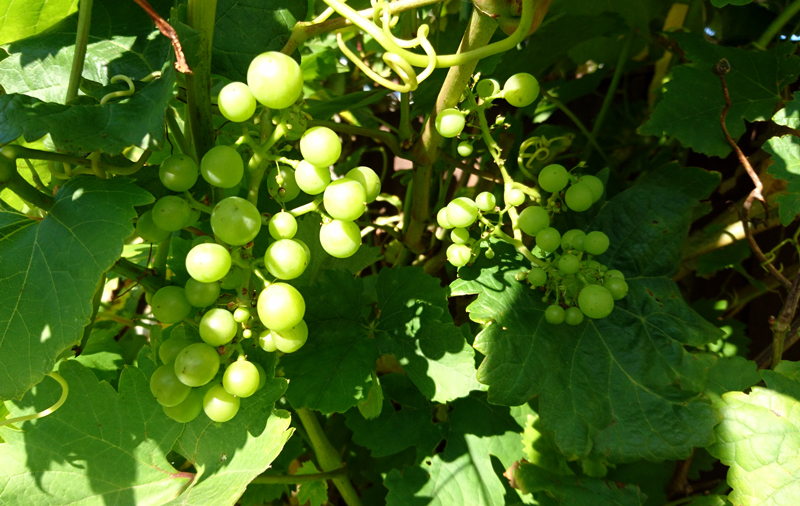 They probably need that strength as the fruits are big and heavy – still green for now, but starting to pick up some colour. A good sunny week (ha!) will do them the world of good. Pesky caterpillars! You must have been devastated! I admire your stoicism – if have probably been in all out murder mode ! Even so, I’m so jealous of your wonderful crops – amazing ! Hope the creepy crawlies have bitten the dust! Yes I have a very bad name in the grub and insect community this week! 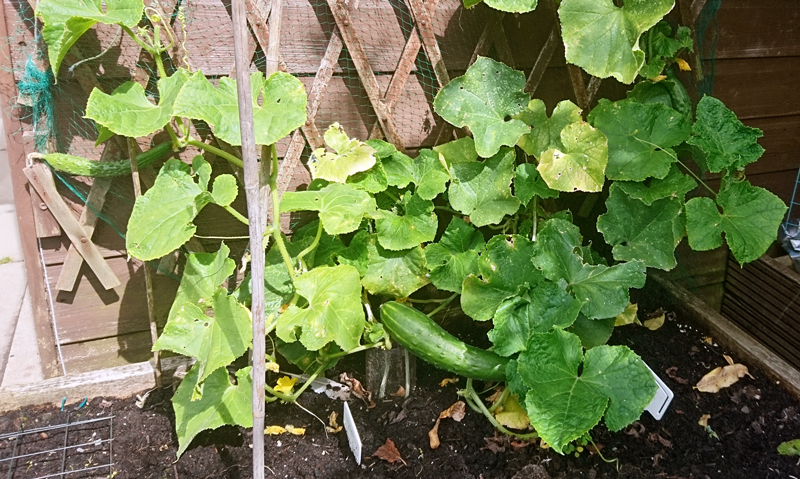 If they reappear I may just drop all this veggie lark and set up as a caterpillar breeder..
Caterpillars are annoying and they eat SO much. Thanks for the post. And thank you for reading 🙂 Yes, they’re public enemy number one round here at the moment!